﻿There’s something about the light that filters through rain clouds that visually sharpens edges, and, literally saturates the colors of succulents and other plants. Tiny yellow flowers pop more against dark gravel and the contrasting foliage of surrounding plants … the salmon tones of ruffle-rimmed echeverias are deeper and more intense … the shadows of a shrugging Cereus peruvianus Monstrosus are more profound. I love how green takes on a new complexity, appearing, by turns, cooler and brighter. 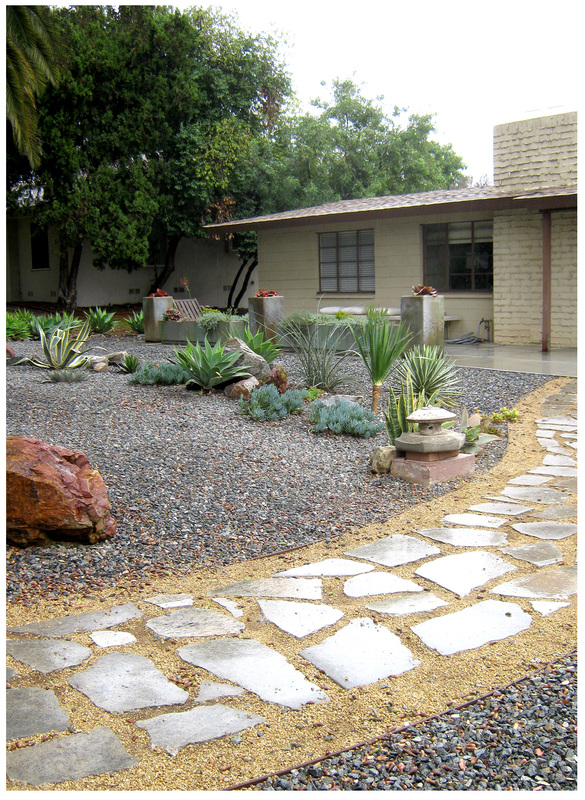 In the front yard, the rain has added pop to the plants and decorative rocks and boulders there. Less varied than the backyard garden, the color story here is mostly green and blue, with occasional jolts of red and orange. The decomposed granite front path glistens wetly and cuts a warm swath of color through all the surrounding visual coolness. 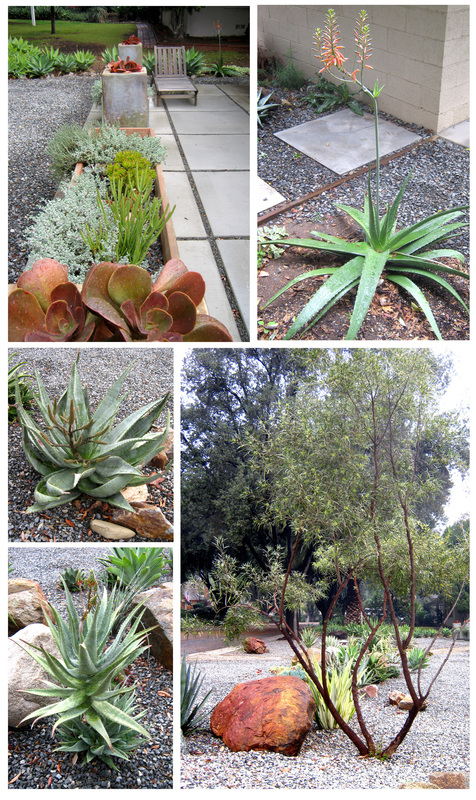 Aloes — in bloom or budding — and agaves, echeverias, and a shapely African sumac tree, are obviously loving all the precipitation, showing their appreciation with much new growth. It’s at wet times like this that the boulders we picked out so long ago show their true colors, too. With origins in Baja California, the reds, rusts and even green and grey tones, of these massive rocks look their best right now. I love rain … I love walking in the rain … I love being at home when it’s raining … and, I plan to be here all weekend. Having reached my Holiday 2010 saturation point, I’m eschewing all party invitations in favor of less waistband-tightening activities like gardening, cooking and housecleaning … Perfect rainy day pursuits, for a dyed in the wool Cancer like myself. The rain also makes the glaucous leaves green. Especially the broccolis. Anywhere to find total rainfall so far in this region? It was in the daily paper in San Francisco but I cannot seem to find any totals for Inland Empire…. Hi, loved your garden pics on facebook! … I was looking for the IE totals, too, but without luck… I thought for sure the local newspaper would have the info but no… I’ll keep looking. Ah you fellow Cancerian, it figures. Your garden/home are looking as lovely as always. We are enjoying a brief sunny spell, as welcome here as the rain is there. Thanks, Loree … Another full day of rain here … and, I shoulda known you were a fellow crab! The garden looks gorgeous and ship-shape, unlike mine with piles of wet leaves. I seriously covet that rain man statue. I love looking at your yard. It is so amazing. I wish I had that much room. Actually if my husband would let me rip out the grass we would. But I haven’t gotten my wish yet. Thanks for the great Xmas greeting. Hope your holidays are super! Didju try the “But, honey, it’ll save us so much money if we took out the lawn!” tack? 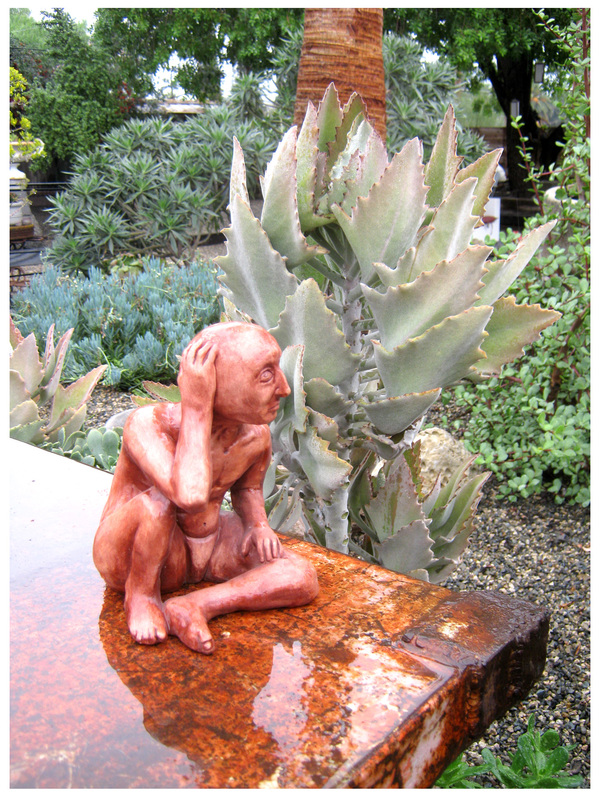 How ’bout: “Omigod, can you believe how much water the neighbors waste on that boring lawn? !” They might work … and thanks for the comment. Hope your holidays are great, as well. Beautiful yard, love the red rock. I could look at your yard all day long. I have to admit, you’ve inspired me to do a bit of work too. I planted a whole mess of plant clippings along the west side of the dog kennels. Built a mounded moat to keep the water in and topped the moat with some local rocks. i really like the way it came out. Thanks for the inspiration to make the world a beautiful place. Wow, awesome! … you made my (end of) day!